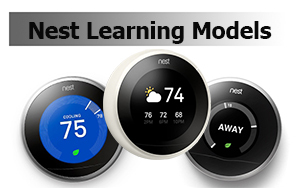 You will agree with me that Nest Learning is among the most dominant brands in the Smart thermostats market. Over the years, it has been redesigned to keep up with other top brands, the likes of Ecobee, Sensi, and Honeywell. Right now, the most popular of the Nest Learning series is the 2nd Gen and 3rd Gen that are quite similar save for the few extras and mods Nest 3 has undergone. However, to most potential customers, this difference is not well understood and this remains a challenge when shopping. For this reason, we have decided to review these models and see what they each offer. But just before that, a short review of each model. Immediately after the 1st Gen started hitting the market, Nest embarked on an upgraded model that came to be known as the Nest 2. It packs the standard features that the original Nest Learning had except for a few changes here and there as well as additional features. Perhaps the biggest change the 2nd Gen model has is the overall compatibility. 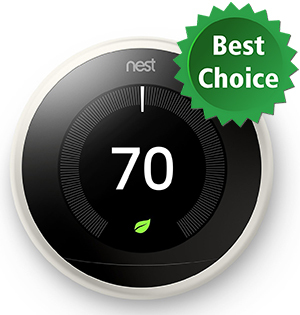 While the Nest 1 is compatible with 75% of household HVACs, the 2nd Gen is compatible with 95%. If you are not sure about your system, this will be the perfect buy; it is very hard to go wrong with it. If you want optimized installation, then things will be much easier with the new System Match feature. It tweaks the learning algorithms thereby activating features like Early On, True Radiant, Filter Reminders and Heat Pump Balance to guarantee optimal performance. I find this thermostat the best because it offers a good share of the features and its price is very affordable. On the downside, just like the 1st Gen, it doesn’t support Apple platforms; Siri and HomeKit. Also, compared to the 3rd Gen Nest, this one is not as reliable when it comes to temperature accuracy. This is the crème of the Nest Learning series and comes in 3 ring colors; copper, white and stainless steel. It packs most of the standard features you get in the 1st Generation and 2nd Generation models. However, there are a few upgrades and tweaks that make it the ultimate Smart thermostat that should top the wish list of any homeowner who wants to save on energy costs. This masterpiece packs a slimmer design and a larger, clearer display with better resolution. Unfortunately, it still isn’t touch-enabled but you can trust it for accurate readings thanks to the additional temperature sensors. There are 10 temperature settings compared to 3 in the previous model. One of the new features it boasts is ‘Cool to Dry’; a technology that detects excessive humidity and turns on the Personally, I live in Jacksonille, Florida and as you know here, humidity ranges between 75 and 76. Worse enough, it fluctuates with every passing minute. With ‘Cool to Dry’, Nest 3 manages humidity and not just displaying its reading. The connectivity is much improved and now has Bluetooth, a feature you don’t get with the previous models. Apart from Bluetooth, its Wi-Fi protocol is also advanced and more powerful than what you get with the previous models. Even with a Wi-Fi mesh network system, there are a few dead spots in my home and even 2.4 GHz band is a little bit strenuous. For this reason, Nest 3 remains a top choice because it comes with a 5 GHz band. Another new feature of the 3rd Gen Nest Learning is FarSight technology. It uses optimized sensors to detect someone from a distance of up to 10m. Once it detects movement, it lights up displaying temperature set, clock, weather widget and so on. The only problem is that just like in the previous models, you can’t adjust the temperature on the screen; remember it is not a touchscreen. If you have one in your HVAC system, you will be able to save more by setting schedules and limits. There’s also Furnace Heads Up that alerts you when it detects there’s something amiss. Unfortunately, this model still lacks room sensors. In as much as it is advanced, it still won’t give a precise room to room temperature. In addition to this, it doesn’t support HomeKit and Siri. Even though it makes sense from a manufacturer’s point of view, it is nonsensical to customers. Also, the almost $250 price tag is quite high! In this segment, we will now compare these 3 models to see how they stack up against each other. First, we will look at the similarities and thereafter, the differences. what’s Common in Nest Learning Models? These Smart thermostats, having been built by the same manufacturer, they have several features that have been maintained in all the models. 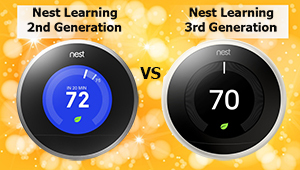 You will find that the Nest Learning 1st Gen all the way to the latest model, the 3rd Gen have the same sensors. Nest included temperature sensors, humidity sensors, near-field and far-field sensors, and ambient light. What’s important here is to note that the 1st Gen and 2nd Gen models offer quite some good accuracy but the 3rd Gen Nest is the real deal. It has 10 temperature settings for more accuracy. What platforms are these models compatible with? This is another area where the 1st, 2nd and 3rd Gen Nest Learning are all similar. They are all compatible with the same Third Party platforms including Alexa, Google Assistant, Google Now, Skybell HD, August Home and so on. Just for the record, all these models don’t work with Apple’s HomeKit and Siri. The explanation for this is rather simple; Apple is Google’s rival and now that Google bought Nest, there’s no way it would allow Nest to support HomeKit or Siri which are Apple’s products. Google suggests that this thermostat can save 20 – 23% of your total energy bills. This is uniform in all the models. On average, I saved 21% though I noted the 3rd Gen was much more efficient courtesy of the 10 temperature sensors for enhanced accuracy. This is the cornerstone of Nest and among the areas, it beats the Ecobee. The learning feature enables the thermostat to note all your favorite temperature settings and adapts to them. In a week or so, it will now be self-adjusting itself so you won’t have to worry about your HVAC settings anymore. All the 3 models have this feature. what’s Different in Nest Learning Models? Even though there is a dozen of similarities between these models, there are several aspects that put them asunder. These are both structural and in terms of features. If you are keen enough, you will realize that there is some slight difference in the size of Nest Learning thermostats. 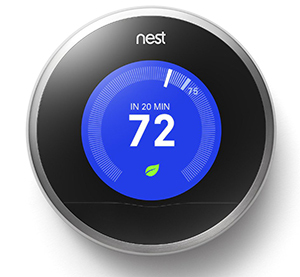 Nest Learning 1st Gen has a 3.2-inch diameter and a depth of 1.44-inches. The 2nd Generation Nest is much larger but again, slimmer. It has a diameter of 3.27-inches and is 1.26-inches deep. On the other hand, the latest model measures 3.25-inches in diameter and at 1.21-inches deep; it is the slimmest of all. Please note that this difference is hardly noticeable as they are quite identical aesthetically. Unlike the design, you will definitely notice the striking difference in display between the first two models and the 3rd Generation. The 1st Gen and 2nd Gen Nest Learning have a 2.75-inch diameter display with a resolution of 320px x 320px. When it comes to the 3rd Generation, this has been greatly improved both in terms of size and resolution. The 3rd Gen Nest Learning packs a 3.25-inch diameter display with 480px x 480px resolution which is much clearer than the other two. These 3 thermostats are compatible with gas, electric, oil, geothermal and solar systems. However, they differ in terms of general compatibility with household HVAC systems. 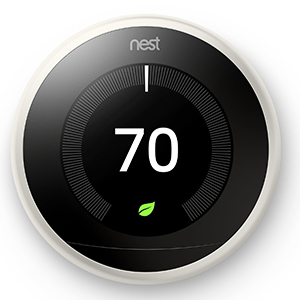 The 1st Generation Nest is compatible with around 75% of American households. This was quite a blow when it came to sales because customers were not sure about compatibility; there was the doubt that you could end up with an incompatible thermostat which is a waste of money. However, with a few tweaks in the wiring system, the 2nd and 3rd Generation is now compatible with 95% of American homes. For those who have an in-depth understanding of Wi-Fi protocols, you will realize there’s a huge difference with these thermostats just from the specifications. You can also note this from their actual performance. I am not complaining about the 1st Generation’s 802.11b/g/n @2.4GHz and Zigbee @2.4GHz but the 2nd Generation’s 802.11b/g/n @2.4GHz and 802.15.4 @2.4GHz is more reliable and efficient. However, it is the Nest learning 3 that carries the day with 802.11b/g/n @2.4GHz, 802.11a/n @5GHz and 802.15.4 @2.4GHz which is super fast and more powerful. Besides this, it comes with Bluetooth LE which is not available even in Ecobee. The 1st Gen model includes auto-schedule, Airwave, Leaf, Auto-away, energy history and time-to temperature – these are the standard features. Time to temperature is a great function that calculates the time required to heat the house to the desired temperature. Energy history helps you audit your energy usage clearing highlighting where you excelled and where you need to improve. Perhaps what I liked most is Auto-away that detects whenever you are away and adjusts the system accordingly thus saving energy. The Nest Gen 2 has three additional features; System Match, Early On, and Heat Pump Balance. On the other hand, the 3rd Generation further has additional features; ‘Cool to Dry’ FarSight, Sunblock Furnace Heads Up, and Water / Boiler control. Worth mentioning is FarSight that enables the thermostat to detect your presence at 10 ft. away compared to 3 ft. in Nest 2. On the other hand, Sunblock detects if the thermostat is heating up because of direct sunlight. The Nest 3 is the best thermostat considering it has 3 times the number of sensors in Nest 2. This guarantees more accuracy and consequently more energy savings. Besides this, it has better Wi-Fi protocol that will work even with weak signal strengths. It also has extras like FarSight, Furnace Heads Up, Sunblock among many others. Away from features, the 2ng Gen and 3RD Gen all retail at the same price range; if there’s a difference, it must be very slight. For this reason, I would recommend that you go for the Nest 3 if you don’t own a Smart Thermostat. However, if you already have the Nest 2, I don’t think there are valid reasons to spend over $200 more on Nest3. But if you are a real energy saving aficionado, why not! Many retailers don’t seem to understand the difference between the Nest 2 and Nest 3. Many are times you hear about customers complaining of having paid for the 3rd Gen. Nest but end up receiving the 2nd Gen. Here is what to look out for just to make sure you have the right thermostat. First, check the bubble color. While Nest 2 has a yellow bubble level at the top, Nest 3 has a blue bubble level at the bottom. Another notable difference is the display connector shape. Nest 2 has a rectangular display connector while that in the 3rd Gen is oval. You can also check the first two digits of the serial number. If you find S/N: 09, this is a 3rd generation Nest Learning Thermostat while S/N: 02 will be a 2nd generation Nest Learning Thermostat. Nest Learning is a great thermostat for anyone looking for an intelligent Smart thermostat that adapts to your lifestyle. However, the models differ a little bit in terms of design and features. So, before making a purchase, make sure that you go for the best one that has all the features you need. Ecobee vs Honeywell Lyric: Which is the Best Smart Thermostat?